We’d love your help. Let us know what’s wrong with this preview of Zone of Emptiness by Hiroshi Noma. To ask other readers questions about Zone of Emptiness, please sign up. Set in an Osaka army barrack during the final stages of a losing war: a place where food rations are low, corruption is high, physical abuse common, and where mobilization, almost certainly, means death. A place where it's each man for himself. 'A place', one of the two protagonists muses, 'where the air that is needed to be human is sucked out from.' It's a vacuum of humanity, a Zone of Emptiness (ahaah!) one might say. On the human level, this book is about a friendship between the protagonist Set in an Osaka army barrack during the final stages of a losing war: a place where food rations are low, corruption is high, physical abuse common, and where mobilization, almost certainly, means death. A place where it's each man for himself. 'A place', one of the two protagonists muses, 'where the air that is needed to be human is sucked out from.' It's a vacuum of humanity, a Zone of Emptiness (ahaah!) one might say. Thematically it's about corruption and various abuses in the army. About class and the evils of hierarchy (both Sōda and Noma are/were attracted to communism). But mostly it's a warning against how militarism has robbed an entire generation of Japanese men of its humanity. The book was written (or at least published) in 1952, when the initial post-1945 pacifism had waned off and Japanese militarism was on the rise again in the shadow of the (then not so) Cold War. (In neighboring Korea, at that time, the war was pretty far from 'cold'.) We can be human beings or we can be militarists, Noma is telling his compatriots, we cannot be both. At the same time, it was written for foreign audiences. Noma is explicit in his foreword that he intends to paint a human face on Japanese soldiers, who were dehumanized not just by the military machine they were part of, but also in the Allied imagination. The cause of our militarist government was wrong, and our officer class may have consisted (at least in part) of criminals ... but our soldiers, like yours, were human beings. At least give them that much. I feel very sympathetic to those messages. So although it definitely has value as a lifting of the militaristic veil, allowing us to see the human face behind it, reading it, unfortunately, was a rather boring task to which I had to push myself through. * Because Sōda is both so priestlike and (probably) like Noma, it may be relevant to note that Noma was a son of a Buddhist priest and was initially brought up to succeed him. What is certainly relevant is that, like Kitani, Noma has spent time in Osaka's military prison himself. † To be fair to the author, this could very well be a translation issue. In the original Japanese these may have been very entertaining scenes that were successful in their purpose. In my (Dutch)‡ copy (which is likely a translation from a third language) they weren't, not to me at least. I have mixed feelings about this book-- I love that we get to intimately know the main characters as the book progresses but as another review mentions, the storyline indeed consists of a lot of people looking for other people. Overall I think it's pretty well written and translated (I had the English version) and recommend it even if you've never been interested in history or war because it hits other very interesting themes such as love, family, values, morality, and friendship. 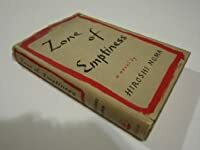 Zone of Emptiness by the Japanese novelist Hiroshi Noma, when it was published in 1952 after years of military censorship, was both shocking to Japanese readers, and widely praised. Like e e cummings’ 1922 The Enormous Room, it is a war novel with no scenes of war. Like From Here to Eternity (1951), much of the narrative is about prison and army cruelty, arbitrary orders and men going against the grain. Published as Shinkū chitai, it was translated into French as Zone de vide by Henreitte de Bois Zone of Emptiness by the Japanese novelist Hiroshi Noma, when it was published in 1952 after years of military censorship, was both shocking to Japanese readers, and widely praised. Like e e cummings’ 1922 The Enormous Room, it is a war novel with no scenes of war. Like From Here to Eternity (1951), much of the narrative is about prison and army cruelty, arbitrary orders and men going against the grain. Published as Shinkū chitai, it was translated into French as Zone de vide by Henreitte de Boissel in 1954; that French edition was translated into English by Bernard Frechtman and published by World Publishing Co, in Chicago, 1958. While a translation of a translation is not auspicious there were few times where I thought meaning was disturbed. Felicity, perhaps, but since the original Japanese would have had structural and grammatical variance from most western writing, I’m not sure a direct translation into English would have been able to avoid some of the style and structural choices. It is quite readable, though culture and behavior of the characters, make an easy, engaged reading a bit out of reach. The story takes place in a large war-time army camp near Osaka, Japan (Honshu Island) where recruits to Fourth-Year soldiers, along with NCOs and officers, are in various stages of training, rehabilitation and being shipped out. Newspaper accounts alert one of the men of the Allied invasion of Italy, September, 1943, so the novel, taking place over a week or two, is in that time frame. No American bombing of Osaka has yet taken place yet. That would start in February 1945. The Battle of Midway (4-7 June, 1942) and Japanese evacuation from Guadalcanal (February 1943) had already happened, however, and was known despite censorship. Discouragement and doubt are seeping into the men. Some 40 characters are named. Two carry the weight of the story: Kitani, a Fourth Year soldier, who has just been released from two years in military prison for a relatively minor crime of theft of an officer’s wallet. He is filled with thoughts of revenge, both on the officer who pushed the maximum punishment, and his woman friend, a prostitute in town, who also testified against him. Tough and smart, he is from an impoverished, rural background, as were most of the recruits. This novel was only printed once in English, in 1956, but is not impossible to find, and I do recommend you find it, as it's a haunting and potent postwar elegy. Although not cited as an influence, I was often reminded of Dostoevsky.